Food for Thought! 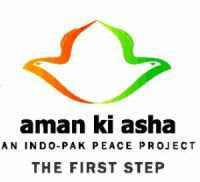 : Aman Ki Asha - Not so Asha from it! TOI and Jang group makes another initiative on 1st January 2010, this time to spread harmony between the two ever fighting nations. The first thing that comes into my mind is, do we really wait for January 1st and make new begining! Nothing changes in a day, we can start things any day and make a difference. Anyways, why is it not supported by other news channels and politicians of both the countries. When its the matter of two nations, it should be atleast supported whole-heartedly. Sangeet toote dil ko jodtaa hai"
Agreed. Lines from Mission Kashmir movie, written by Sameer and Sung by Shankar. The adv is trying to connect common people from two nation, bypassing the politicians. I doubt if it is going to be appreciated by any political party. Its also good branding exercise by TOI... trying to make a statement, otherwise limited role played by the nation newpapers as a whole. I see few awards for the initiative for sure. I am not among the pessimist bunch, but if we look at it practically, the impact is going to be really insignificant. Such initiatives should be carried out. It is not going to make any difference in either of the side, nor its going to move our politians a bit. But, it just keep the hopes alive. It keep us reminding that afterall hatered is not the only solution and we can be considerate at some point of time. It also ensures that movie and music business is not hurted because of the stubborn stance at the highest level. My take, nice initiative, "the first step" seems alright, atleast somebody is thinking on these lines, but we need more actions rather than just words!